Marks 4 Dimensions 26 1/4" x 13 1/4"
If there would be something like a Rolls Royce among water guns, the CPS 1500 would be it. It's rare to find one, some structure flaws, outperformed by bigger newer models, but so well rounded in power, size, ability and classiness, that one has to say that they don't build them today like in the good old days. The CPS 1500 has around the same power like the CPS 1000, with a 5X and 10X nozzle. It has a strap, and a big tank to take on every soaker. 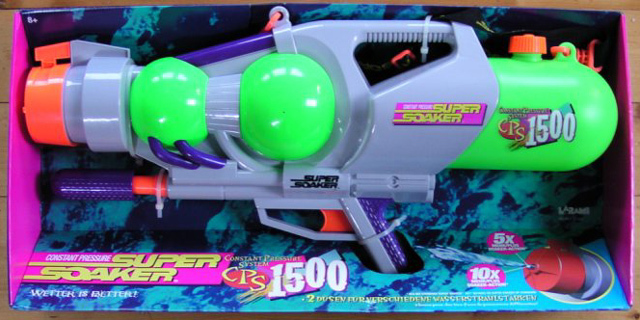 The coloring and shape, is what I would expect from a good old water gun. The pumping is so quiet that one almost does not hear it while pumping the water into the pressure tank. It's the ideal weapon for sniping and stealth missions. Its drawback is the fragile pump, which can be broken if one pumps to wildly. Other than that, you can go head to head against any other soaker except the ones with 20X nozzles and the MXL dual nozzle. This soaker is a must have for every water fighter and soaker collector, and if you have the rare opportunity to buy one, do it.